From social media to documentaries, architecture to installations, Ai uses a wide range of mediums to encourage his audience to question and confront society and its values. Although they appear documentary and nondescript, the blog posts in An archive represent Ai’s ongoing resistance to censorship. Curator Hans Ulrich Obrist has argued that Ai’s blog can be seen as ‘social sculpture’, a term coined by German mid-20th-century artist Joseph Beuys to designate actions and structures within society as art. Beuys’ belief in the political and social efficacy of works of art, underpinned by his expanded definition of art that framed everyone as an artist, plays out in Ai’s politically charged provocations. ‘Everything is art. Everything is politics,’ Ai has said. Armed with his blog and other forms of social media, Ai turns every attack upon him into a work of art that only calls further attention to authoritarian systems that reject open, democratic processes. 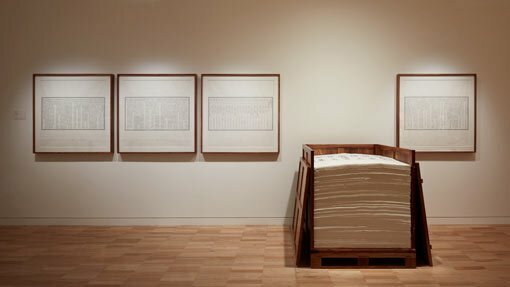 Gene Sherman got to know Ai Weiwei in 2006 through the Sherman Visual Arts Residency programme, and the work he created for the first Sherman Contemporary Art Foundation (SCAF) project in 2008 was one of his first international shows. Go East is presented in partnership with Sherman Contemporary Art Foundation (SCAF), Sydney. It is exhibited across two sites: the Art Gallery of NSW and SCAF in Paddington.